More than 31-million Americans will spend a half-million dollars this month on Halloween costumes, not for themselves, but for their dogs and cats. Also, be sure the costume doesn’t restrict breathing, and make sure there are no small pieces a dog can chew off and ingest. 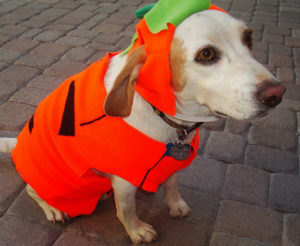 Wiese says no matter the cute factor, some pets won’t tolerate a costume, so don’t force it. People pose with their pets in family photos and have their pets sit on Santa’s lap at Christmas, so it’s little surprise Halloween costumes for animals are becoming such big business. Some folks even plan ahead and have trick-or-treat bowls filled with animal goodies for neighbors’ critters. A survey finds the most popular pet costumes this year include: pumpkins, hot dogs, devils, Star Wars characters and superheroes.